The most important step I believe in creating a good portrait is having a good rapport with whom ever you are photographing, and making sure that the subject is totally comfortable with the entire process. Joe and I had 2 separate conversations about this photo, and to his credit he really gave me full control and let me lead the way. 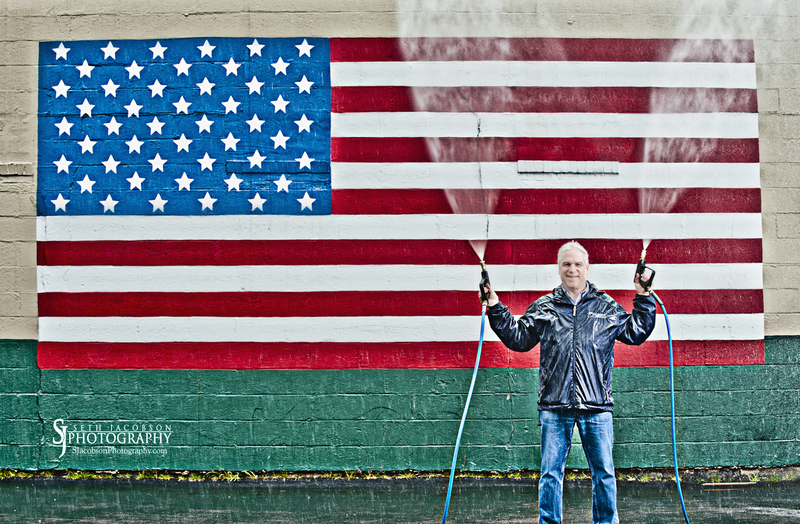 We really talked quite a bit about the concept and what we were trying to create here and we settled on the idea of Joe shooting off two pressure washer guns in front of the flag he has painted on the side of his building because obviously he is patriotic but he is quite a playful and funny guy so I think this speaks to who he is as a person and what the business is about. The day we ended up with was a VERY rainy one and I think it actually helped quite a bit in creating the look that I wanted. The light was very soft and diffused which allowed me to really make Joe pop off the back ground using a couple of lights. 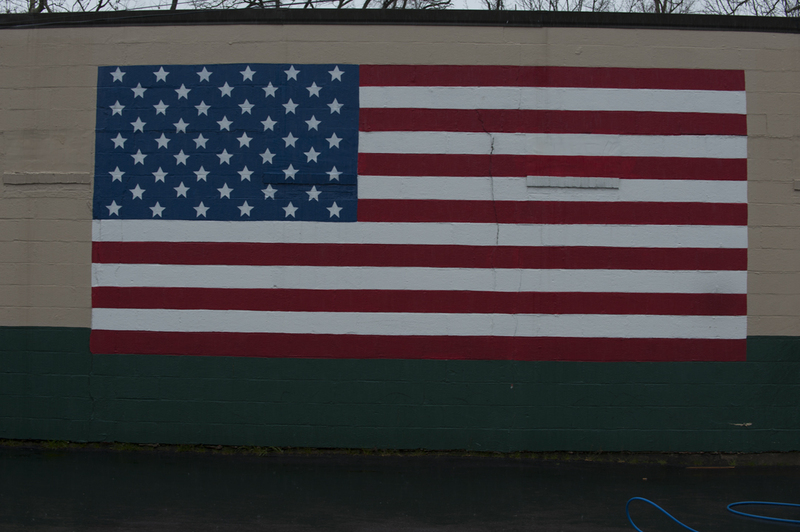 First I ran out into the rain to figure out which lens to use. I decided on my 70-200 zoom shot a few test photos to get my exposure correct on the back ground and then quickly ran back inside to get out of the rain. 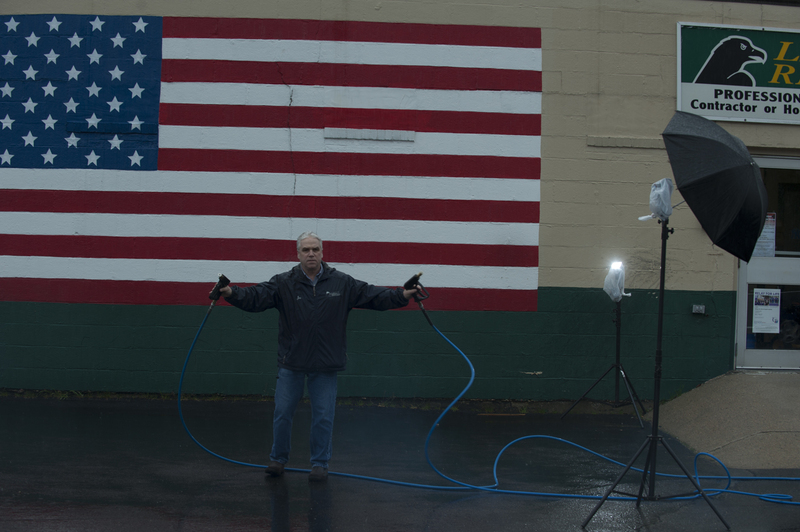 Then I set up 2 lights that were triggered by pocket wizards one behind Joe pointing up toward where the spray from the guns was going to be to set that off and separate it more from the flag, and another using a reflective umbrella above and in front of Joe about 4-5 feet away from him. I believe the flash set on Joe was set on full power and the one behind him was set to 1/2 power. Both flashes had grocery bags over them which protected from the rain but also diffused the light coming off from them a little as well. Here it is! The finished product!